Bumps In the Road – He Said What?! I don’t know that there is any one routine of Aaron’s that is more important than another, but if I was pressed for an answer I would say that his bed time routine is way up there near the top of his Important Routines List. And by the way, it would be just like Aaron to keep a list of such things if he thought of it, in yet another notebook for which he would find the perfect spot in his room….and there it would stay, placed exactly so, every single day of his life. The strictness of his bed time routine, which includes going to bed at or very near the same time that I go to bed, is the reason I began preparing him for a change early Sunday evening. I could tell right away that he didn’t like this idea. “What time?” he asked with a frown on his face. “I don’t know exactly what time,” I replied. Aaron thought for a few seconds, pondering this unwelcome change. Mom might go to bed before I go to bed? “Will it be before night? !” he asked with great concern. I knew he meant before dark. Would I go to bed before dark?! How disruptive and awful…..for HIM. Never mind about my cold or about how I felt. Aaron is, without doubt, most often about Aaron. I assured him that I would not go to bed before night, and he walked away to think on this sudden turn of events. But as it turned out, I ended up asking Aaron later that evening if he wanted to play a game of SkipBo. That game took up part of the time before night, so Aaron was saved, and our bed time routine was really no different than any other night. During the night some storms moved through our area. They were pretty rough storms, and we briefly lost power several times. That meant that Aaron’s clock on his night stand was disrupted and probably flashing, I thought, as I reset the clock on the microwave that morning. Sure enough, when Aaron walked in the kitchen later, the first words out of his mouth were about his messed up clock. Knowing the importance of this part of his morning routine, I followed him upstairs immediately. He called out the time to me from his satellite clock by his desk as I pushed the buttons on his clock and got the time just right. He then wrote the correct getting-up time in his notebook, and all was well for the moment. Aaron dressed and came down to the kitchen again to take his pills. Soon he was holding an object of great interest to him…..a summer squash from our garden that was very dark, bumpy, and tough. 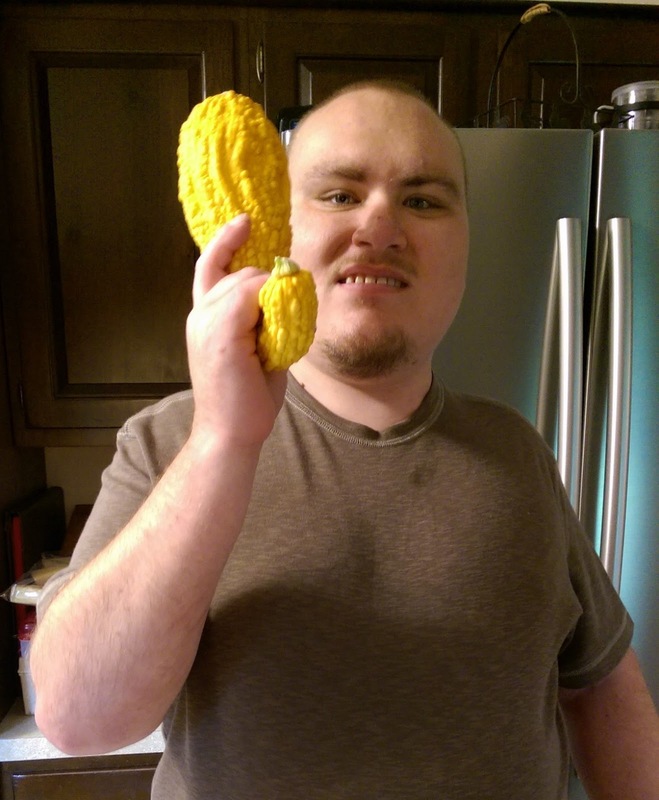 Any item that is the least bit unusual holds Aaron’s attention, and for the moment this bumpy squash was what Aaron wanted to hold and feel and talk about. In fact, he carried the squash up to his room and placed it on his chest of drawers. I was tempted to bring it downstairs right away, but I decided to leave it there for the time being. What did it hurt? Aaron had a doctor appointment later that morning. As we drove across town, he told me about a song from a movie he was watching. He hummed the song for me to hear and to identify. Usually I can’t really tell what he is humming, but this time he did a great job and I knew the song….except for the life of me I couldn’t remember the title. I told Aaron about my Sound Hound app that would let me hum a few bars while it identified the song, so Aaron could hardly wait for me to do just that. We found an area of the doctor’s waiting room that had no one sitting close, and so with a very excited Aaron sitting beside me, I sat there humming this song into my phone. It was pretty funny! And sure enough, Sound Hound told us that the song was “Joyful, Joyful We Adore Thee.” Aaron bent over in his chair, his hands rubbing together quickly and with great delight, as I wondered how on earth I could forget the title to that song. We waited to be called and Aaron, who can hardly keep his doctors straight by name, asked, “Is it gonna be that one who asked me if I use drugs? That was dumb!” No amount of explaining will ever change Aaron’s mind that it was very dumb for a doctor to ask him if he uses drugs. The doctor soon called for Aaron to come, so we both followed him to his office. He stepped back for us to enter, and he said, “Hi, Aaron!” To which Aaron replied….with nothing. Total silence. I was glad that he smiled with what I hoped was understanding. This is just our second time to see this doctor, who is supposed to have an understanding of autism. I hoped that understanding of his was working today. The doctor began asking questions about how Aaron was doing since the last visit. How are his seizures? So we discussed that issue at length. How are his behaviors? We talked about that as well. I was talking and the doctor was listening, when suddenly on my leg came a big WHACK!! That was what Aaron used to say when he was a kid if someone was telling something they shouldn’t, or something he wished they weren’t. The doctor’s eyes were staring from over his computer screen as I talked to Aaron. I knew very well why Aaron whacked my leg. He was frustrated at being talked about. He does have feelings. So I explained why the doctor needed to know these things, and the doctor chimed in as well, and Aaron settled down. Oh well. The doctor may as well see Aaron as Aaron is. And it was probably good for both the doctor and me to be reminded of Aaron’s sensitivities. I know that Aaron is facing another sensitive issue today, too. One of his favorite Paradigm staff has left, and so Aaron’s life there will change a lot. I know that if one thing in life is certain, it is that life will change. Easy for me to say……far harder for Aaron to deal with in an appropriate way. Of all days for Aaron to find this out, too. Aaron was grouchy this morning about going to his group today. Three days off sometimes does that to him. He went willingly after working through it, but gave the van door a little harder shove closed than usual when he got out. I have no idea how his day has gone or if he knows of his staff that has left, but I’m sure I’ll soon find out when he comes home. 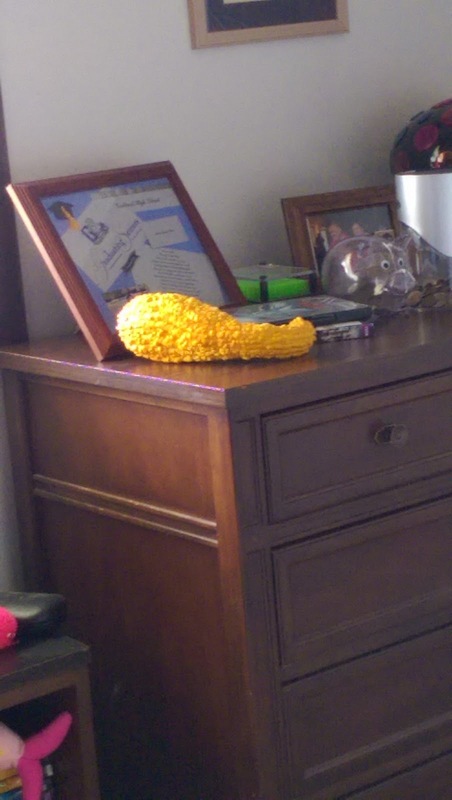 I thought of all this when I walked upstairs earlier and saw the bright yellow squash sitting in Aaron’s room. That squash, so full of bumps. The bumps are what fascinate Aaron. They are also what make that squash somewhat tough. Aaron has plenty of bumps in his life, too. I’ve seen several of them in the past couple days, much less all the years that he has dealt with so much. Bumps in the road are a part of life. Some seem to have more bumps than others, that’s for sure. Gary and I are sometimes able to ease Aaron over the bumps, like I tried to do concerning the possible change in my bedtime. Sometimes issues are easily solved, like changing the time on his clock or humming into Sound Hound. Other matters are deeper, like the one evidenced by the whack on the leg that Aaron gave me. He didn’t like being discussed, but it’s necessary. It’s painful for us both, and is a bump that he and I both deal with at nearly every doctor visit. This new bump, of one of his favorite people being gone out of his life now, will be a huge new bump for us. I don’t know how it will affect Aaron. He may surprise us and do well. He may have good days and bad days. But it’s a bump that we will be forced to navigate one way or another. I’m thankful for the wisdom that God promises to give to those of us that are lacking and that ask Him for it. I have been asking today, that’s for sure! Maybe I’ll just leave that bumpy squash in Aaron’s room. It will remind me every time I see it of this time. Hopefully I will look at it in the weeks to come and remember how God eased us over yet another bump in this road we travel with Aaron. Previous Previous post: Who Am I Now?